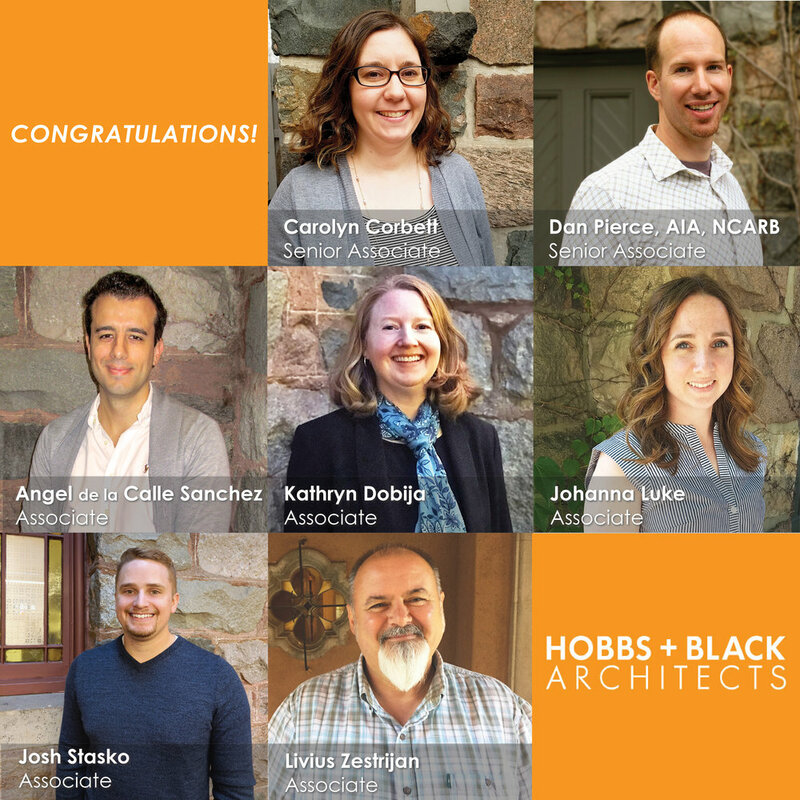 Hobbs+Black Architects is pleased to announce the following staff promotions as we begin another successful year. As Senior Associate and an integral part of the Hobbs+Black team for over a decade, Carolyn’s workload currently includes new building construction for The University of Michigan Credit Union (Carpenter Road Branch), facility renovations at Centria Healthcare, and the new parish hall for St. Francis of Assisi Catholic Church. She has been instrumental in coordinating with project clients and all engineering disciplines to translate project and interior design into comprehensive contract documents for construction for a variety of religious, educational, retail, and work space projects. Additionally, her expertise in the bidding and negotiation process makes her a key associate during the life cycle of each project. Carolyn’s past experience includes work on notable projects such as The Goddard School of Novi, Home Point Financial – Ann Arbor Headquarters, Plunkett Cooney Law Offices in Bloomfield, Fort Shelby Hotel, various projects at Macomb Community College, and Washtenaw Community College Student Center Building. After joining Hobbs+Black in 2015, Dan quickly proved himself a key player by providing support for team members during project development and construction phases. With the ability to adapt project scales from multi-million dollar commercial developments to house renovations. Dan has a plethora of major ventures on his resume that include RH Nashville, Partridge Creek: Cabin at the Creek, Bavarian Inn Cheese Haus, and LLamasoft Ann Arbor office fit-out. Included in Dan’s skill set is the ability to navigate all phases of architectural design from the schematic phase to construction administration as well as project close-out. Additionally, his management of large sites with multiple buildings and varied building architecture has made him instrumental as a team member with current jobs that include Woodward Corners by Beaumont and RH locations in Edina and Columbus. His expertise in communicating client objectives and goals to ownership groups helps to achieve results for the client, and keeps information flowing to propel the project forward. Congratulations to all on a job well done and best wishes for continued success! Learn more about the Hobbs+Black team at hobbs-black.com/team. Hobbs+Black Architects, founded in 1965, ranks among the top 300 architectural firms nationally. Hobbs+Black Architects offers a full range of architectural and interior design services and specializes in institutional work including hospitals, educational facilities, religious facilities and multi-family housing. With corporate headquarters in Ann Arbor, MI, Hobbs+Black Architects also operates regional offices in Lansing, MI and Scottsdale, AZ. For more information, please visit hobbs-black.com. Hobbs+Black celebrates the bittersweet end of summer with a staff parking lot BBQ each year. National Architecture Week is here! At Hobbs+Black, our dedicated and talented team of design professionals routinely bring ideas to life. During #ArchWeek18, we're taking this opportunity to introduce our key associates who make a shared vision reality. 1. Who/what influenced your desire to become an architect? My family would blame a set of Lego blocks for shaping my career goals toward architecture. At a very young age, my parents gave me a Lego set and found me so interested that it became “the gift of choice” for family and friends, which added to the my ability to spend long hours building ideas. Over the formative years expression continued through Lincoln Logs, an Erector Set, and Sky-Rail Monorail building set. 2. How long have you been in the industry? 3. Is there anything that inspires your work? Organizing things has always been a prime tendency, but the sculptural and rustic quality of works by Le Corbusier have always been an inspiration. When the opportunity arises, I love the peaceful experience portrayed in Kyoto Zen Gardens – the importance of “entry” and the sequence of form experienced through movement. 4. Why did you decide to become an architect? What do you enjoy most about your chosen profession? I became an architect because of my relentless inward need to organize and create, which is well expressed through the search to solve three-dimensional problems! 5. Tell us a fun fact about yourself. My wife Connie and I love our two cats “Princess Misty” and “Prince Thaddeus”… hopefully we serve them well! My parents and grandparents. Fortunate to have traveled often with them while growing up, I was exposed to architecture and people. It’s these experiences that opened my eyes to the built environment. This year marks 20 years since my first internship in architecture. Satisfied clients and seeing people experience the finished product. Architecture is the collaboration of art, history and engineering, all of which I enjoy. The thing I enjoy most about the profession is that there is never a repetitive day, each comes with a new client, a new project, and a new set of challenges. I worked as a security guard at the Olympics in Atlanta, Georgia and was stationed at Centennial Park where the bombing went off. Luckily it was my night off, but was later interviewed by the FBI. Hobbs+Black Architects is proud to announce the promotions of Bob Hoida, Dennis McGowan, John Mortimore, Jon Pearn, Ryan Wrigley, Kevin Short, Keith Byron, and Diane McIntyre.